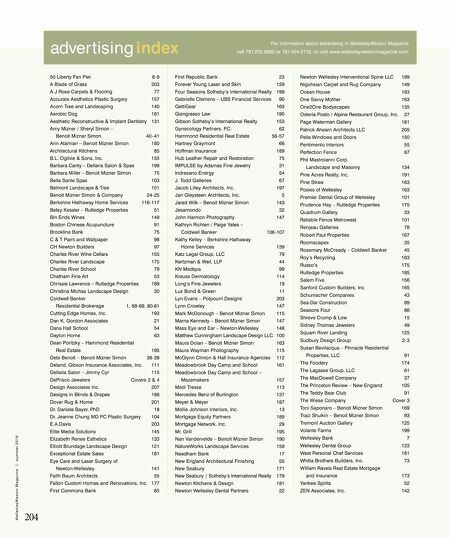 advertising index 50 Liberty Fan Pier 8-9 A Blade of Grass 203 A J Rose Carpets & Flooring 77 Accurate Aesthetics Plastic Surgery 157 Acorn Tree and Landscaping 140 Aerobic Dog 181 Aesthetic Reconstructive & Implant Dentistry 131 Amy Mizner / Sheryl Simon – Benoit Mizner Simon 40 - 41 Ann Atamian – Benoit Mizner Simon 180 Architectural Kitchens 85 B.L. 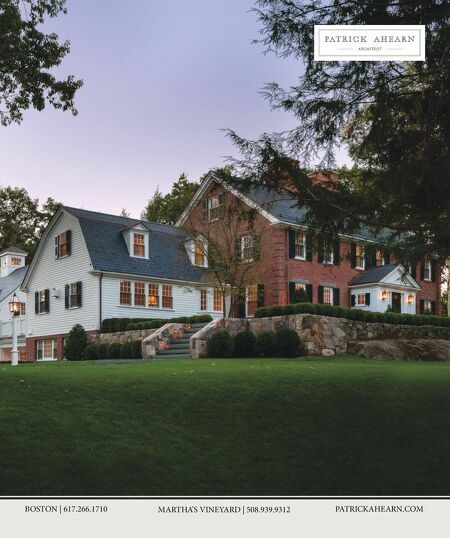 Ogilvie & Sons, Inc. 155 Barbara Canty – Dellaria Salon & Spas 199 Barbara Miller – Benoit Mizner Simon 75 Bella Sante Spas 103 Belmont Landscape & Tree 151 Benoit Mizner Simon & Company 24-25 Berkshire Hathaway Home Services 116-117 Betsy Kessler – Rutledge Properties 51 Bin Ends Wines 149 Boston Chinese Acupuncture 91 Brookline Bank 75 C & T Paint and Wallpaper 98 CH Newton Builders 97 Charles River Wine Cellars 155 Charles River Landscape 175 Charles River School 79 Chatham Fine Art 53 Chrissie Lawrence – Rutledge Properties 189 Christina Michas Landscape Design 30 Coldwell Banker Residential Brokerage 1, 68-69, 80-81 Cutting Edge Homes, Inc. 193 Dan K. Gordon Associates 21 Dana Hall School 54 Dayton Home 63 Dean Poritzky – Hammond Residential Real Estate 195 Debi Benoit – Benoit Mizner Simon 38-39 Deland, Gibson Insurance Associates, Inc. 111 Dellaria Salon – Jimmy Cyr 115 DePrisco Jewelers Covers 2 & 4 Design Associates Inc. 207 Designs in Blinds & Drapes 186 Dover Rug & Home 201 Dr. Daniela Bayer, PhD 18 Dr. Jeanne Chung MD PC Plastic Surgery 104 E.A.Davis 203 Elite Media Solutions 145 Elizabeth Renee Esthetics 133 Elliott Brundage Landscape Design 121 Exceptional Estate Sales 181 Eye Care and Laser Surgery of Newton-Wellesley 141 Faith Baum Architects 55 Fallon Custom Homes and Renovations, Inc. 177 First Commons Bank 65 First Republic Bank 23 Forever Young Laser and Skin 129 Four Seasons Sotheby's International Realty 199 Gabrielle Clemens – UBS Financial Services 90 GettiGear 163 Giangrasso Law 195 Gibson Sotheby's International Realty 153 Gynecology Partners, P.C. 62 Hammond Residential Real Estate 56-57 Hartney Graymont 66 Hoffman Insurance 189 Hub Leather Repair and Restoration 75 IMPULSE by Adamas Fine Jewelry 31 Indresano Energy 54 J. Todd Galleries 67 Jacob Lilley Architects, Inc. 197 Jan Gleysteen Architects, Inc. 5 Jared Wilk – Benoit Mizner Simon 143 Jesamondo 32 John Harmon Photography 147 Kathryn Richlen / Paige Yates – Coldwell Banker 106-107 Kathy Kelley – Berkshire Hathaway Home Services 139 Katz Legal Group, LLC 79 Kertzman & Weil, LLP 44 KN Medspa 99 Krauss Dermatology 114 Long's Fine Jewelers 19 Lux Bond & Green 11 Lyn Evans – Potpourri Designs 203 Lynn Crowley 147 Mark McDonough – Benoit Mizner Simon 115 Marna Kennedy – Benoit Mizner Simon 147 Mass Eye and Ear – Newton-Wellesley 148 Matthew Cunningham Landscape Design LLC 100 Maura Dolan – Benoit Mizner Simon 163 Maura Wayman Photography 115 McGlynn Clinton & Hall Insurance Agencies 112 Meadowbrook Day Camp and School 161 Meadowbrook Day Camp and School – Mazemakers 157 Medi Tresse 113 Mercedes Benz of Burlington 137 Meyer & Meyer 187 Mollie Johnson Interiors, Inc. 13 Mortgage Equity Partners 189 Mortgage Network, Inc. 29 Mr. Grill 195 Nan Vandervelde – Benoit Mizner Simon 190 NatureWorks Landscape Services 159 Needham Bank 17 New England Architectural Finishing 55 New Seabury 171 New Seabury | Sotheby's International Realty 179 Newton Kitchens & Design 181 Newton Wellesley Dental Partners 22 Newton Wellesley Interventional Spine LLC 199 Nigohsian Carpet and Rug Company 149 Ocean House 183 One Savvy Mother 163 One2One Bodyscapes 135 Osteria Posto / Alpine Restaurant Group, Inc. 27 Page Waterman Gallery 181 Patrick Ahearn Architects LLC 205 Pella Windows and Doors 150 Pentimento Interiors 55 Perfection Fence 87 Phil Mastroianni Corp. Landscape and Masonry 134 Pine Acres Realty, Inc. 191 Pine Straw 163 Posies of Wellesley 163 Premier Dental Group of Wellesley 101 Prudence Hay – Rutledge Properties 175 Quadrum Gallery 33 Reliable Fence Metrowest 101 Renjeau Galleries 78 Robert Paul Properties 167 Roomscapes 35 Rosemary McCready – Coldwell Banker 45 Roy's Recycling 163 Russo's 175 Rutledge Properties 185 Salem Five 156 Sanford Custom Builders, Inc 165 Schumacher Companies 43 Sea-Dar Construction 89 Seasons Four 86 Shreve Crump & Low 15 Sidney Thomas Jewelers 49 Squam River Landing 125 Sudbury Design Group 2-3 Susan Bevilacqua – Pinnacle Residential Properties, LLC 91 The Foodery 174 The Lagasse Group, LLC 61 The MacDowell Company 37 The Princeton Review – New England 105 The Teddy Bear Club 91 The Wiese Company Cover 3 Toni Saponaro – Benoit Mizner Simon 169 Traci Shulkin – Benoit Mizner Simon 93 Tremont Auction Gallery 125 Volante Farms 199 Wellesley Bank 7 Wellesley Dental Group 123 West Personal Chef Services 181 Whitla Brothers Builders, Inc. 73 William Raveis Real Estate Mortgage and Insurance 173 Yankee Spirits 52 ZEN Associates, Inc. 142 204 W e l l e s l e y W e s t o n M a g a z i n e | s u m m e r 2 0 1 6 For information about advertising in WellesleyWeston Magazine, call 781.235.6980 or 781.424.2118, or visit www.wellesleywestonmagazine.com.